The old school text book I have today is "Learn Pascal in 3 days (third edition) by Sam . A. Abolrous". 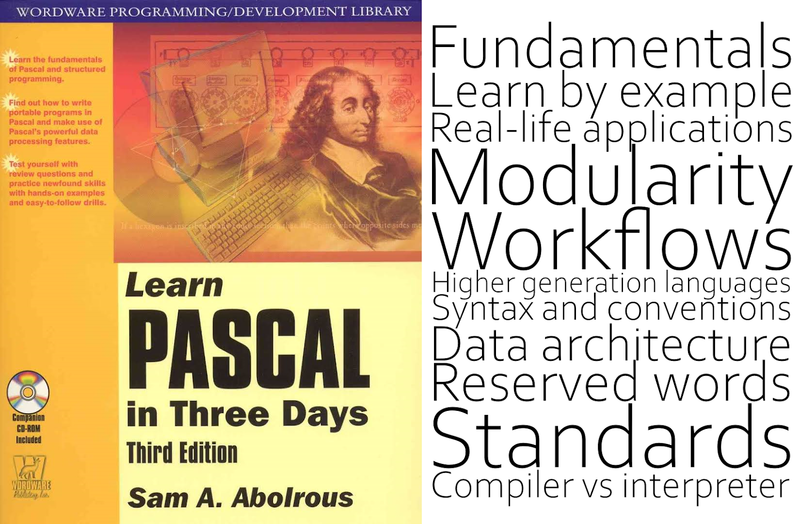 Side note, my O Level computer SBA name was PASCALS - Programmed And Simplified Computerised All-Purpose Library System. My approach this time was to identify some talking points after breezing through the book. These are them with me saying a few about each. Fundamentals - Important. These are our building blocks. Learn by example - This reminds me of this that I found online, "Why is learning programming hard? Programming is a PRACTICAL subject. You learn by doing ...". Example then practice and experiment and then apply. Real-life applications - Tech and coding is far reaching. It is everywhere and it is what we are using to make our lives better. Modularity - Key concept. Take a massive problem and break it into small pieces. Workflows - Workflows are everywhere. If we can have software that allows us to churn out workflows quickly and efficiently we will be in a plenty better position. Which directs me to the concept of a codeless future. Higher generation languages - As programming languages evolve we are able to do more with less coding and less skill. Syntax and conventions - These are tied to readability, maintenance and ease of writing code. Data architecture - The movement and storage of data. Efficiency, security, accuracy are some things that come to mind. Reserved words - This is interesting because I want to point out that there is a difference between reserved words and keywords. Standards - Extremely important. Just ask any web developer trying to develop for the multitude of devices, OSes and browsers. Compiler vs interpreter - These are language processors but not the complete list. There is translator and assembler and now I am wondering what others? And these days we talking natural language processors. Share your thoughts and comments with us in the comments below.